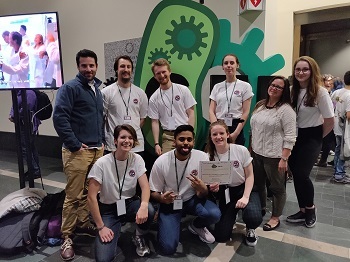 Congratulations to the 2018 Edinburgh Undergraduate iGEM team who have been awarded a Gold Medal at the annual iGEM jamboree event in Boston. The interdisciplinary team comprised members from across the University and this year included Chemistry (MBC) student Inga Gražulytė. This year’s team continued Edinburgh’s success in the competition and were also nominated for the ‘Best Foundational Advance Prize’. Details of the team’s project – developing a genetically non-viable bacterial host for synthetic biology applications - are on the iGEM website. The International Genetically Engineered Machine (iGEM) Foundation is an independent, non-profit organization dedicated to education and competition, the advancement of synthetic biology, and the development of an open community and collaboration. iGEM began in January 2003 as an independent study course at the Massachusetts Institute of Technology (MIT) where students developed biological devices to make cells blink. This course became a summer competition with 5 teams in 2004 and continued to grow to 13 teams in 2005; it expanded to 300 teams in 2016, reaching 42 countries and over 5,000 participants.